I began to see the exotic side of the tomatillo once in the US. Growing up in Mexico, they were a standard at every market, part of our weekly mandado, present in our family meals at least half a dozen times a week: in salsa verde to pour on top of almost everything, in enchiladas, chilaquiles, bathing fish, covering a shredded meat and potato stew, and sometimes cactus paddles. 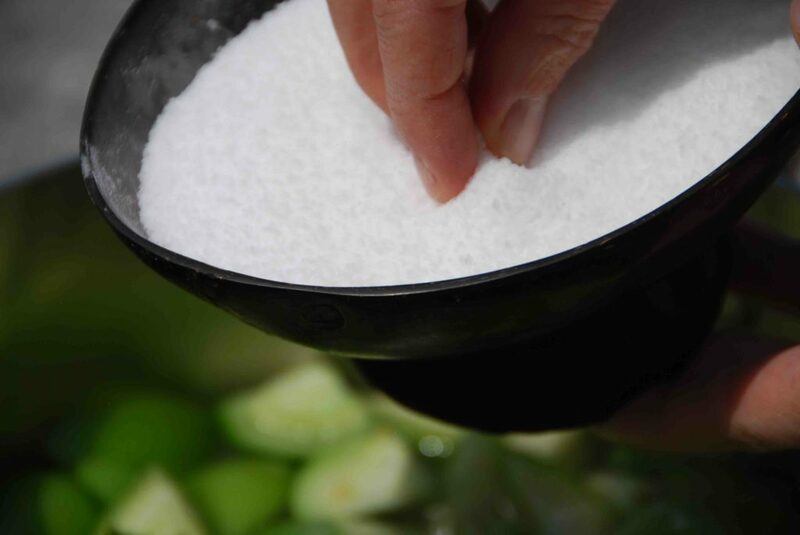 Think something like salt … how odd it is to find a kitchen without salt? Once we moved to Texas, the only place I could find them was in Latino stores. As the years moved on, there was no one I met without a Mexican connection who had ever cooked with a tomatillo or even dared to bring one home. Sure, many people love salsa verde and eat it in restaurants or buy a jar at the store, but few know that its star ingredient, is the tomatillo. It’s hard to tell what a gorgeous creature the tomatillo is from the outside. With its papery husk specked with dust that sticks to the sticky and seemingly mossy skin… So fifteen years later, now that they are not only in Latino stores but also in mainstream ones, its no surprise to see that not many people place them in their baskets. But, husked and rinsed, stripped down to their natural glory, tomatillos are a stunner. Bright and crisp, smooth and shinny, with a firmer flesh than the tomato and with an unmatchable tart flavor, they are stars undercover waiting to be discovered. Amazing it is, that I realized how unique they are once outside of Mexico. Moreover, how versatile they can be. Not only for salty spins, but for sweet ones too. And always, so easy to use. I’ve now used them cooked and raw, in sauces, stews, salads and one of my favorites: Jam. The brilliant and adventurous Mexican Chef Enrique Olvera first introduced me to the sweet spin of tomatillos, when he came to DC to cook for a special event at the Institute. He and his sous chef, prepared a quick tomatillo jam made with water, vinegar and sugar and served it with a variety of cheeses and crackers. Heavenly! Playing with his idea, being a fan of the combination of the tartness of the tomatillo with the tangy taste from citrus, after quite a few tries I found what has now become a staple in our home. 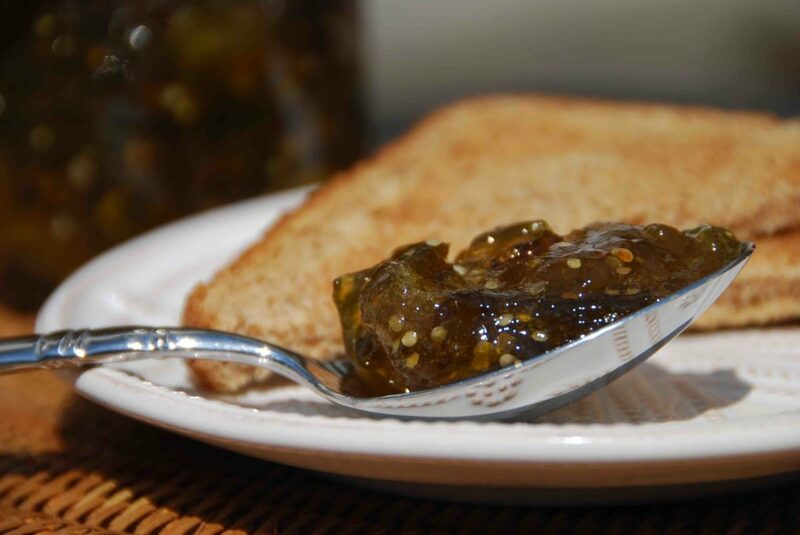 A tomatillo and lime jam. 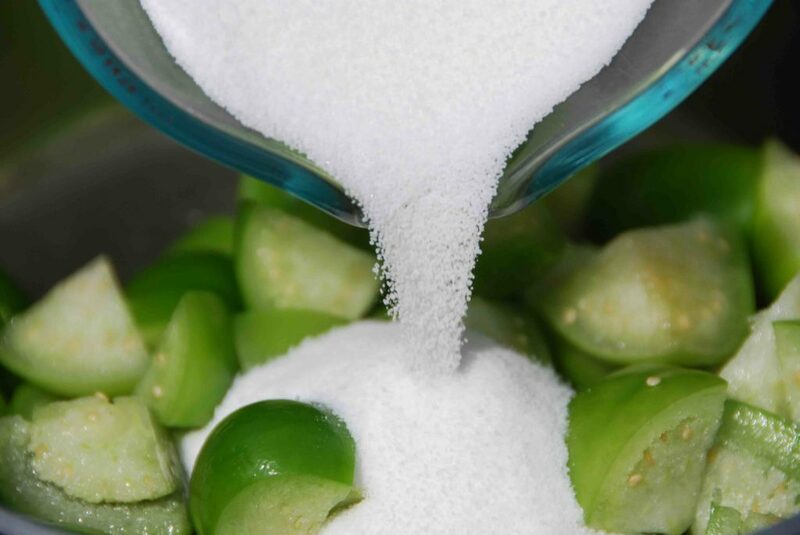 All you do is dice those tomatillos, place them in a medium sauce pan along with the sugar, and the lime rind. You can add the rind in a long single piece or you can cut it into little pieces, which I am now getting fond of as you can enjoy those delicious bites later on. Bring it all to a medium simmer, and let it thicken until it has a thin and loose jam consistency. Keep an eye on it as it does, and stir here and there… Don’t let it thicken too much because it will thicken as it cools. Well, I also love that set of plates my sister Alisa gave me for my birthday and think they photograph so beautifully. Or, why not? Just spoon it right into your mouth. Like I do. You will bite not only those delicious tomatillo seeds covered in that sweet, tart, tangy jam, but you will also get those irresistibly bitter caramelized pieces of lime rind. Place all of the ingredients in a saucepan set over medium-high heat. Let the mixture come to a simmer and stir occasionally, letting it cook until it has thickened and achieved a soft jam consistency. What a unique and delicious recipe. Thank You Pati for your creativity. Every year at Christmas I make something special to give as gifts and this will be it! I hope everyone loves their gift, Joanne! I added two chopped poblanos for a little zing. I think it will go great with pulled pork or roast chicken. Pati, I have been using this recipe and also adding either arbol or jalapenos and it is devine either way. YUM! Thank you!! Oh I’m glad you made the recipe your own and added some spice, Brad. Happy kitchen adventures! Can I use a blend of different varieties(colors) of Tomatillos for this recipe? I have yellow, green and purple. They have been ripening at different rates so instead of a lot of one color, I have a pretty large group of yellow with some green and purple tomatillos. P.S. I love your recipes!!!! I have billions of tomatillos and need recipes for them. I love the idea and how this tastes but I followed the recipe exactly and what I have is soup. That’s a lot of tomatillos, Michael! If the jam hasn’t set by the next day…it might need a bit longer of a simmer the next time. This jam is incredible! I love it’s fresh lime punch. Passing it on to friends…Thanks. Thank you for sharing it with your friends Paula! This is a great recipe! The translation for the recipe needs to be “mermelada de tomatillo” “Tomate verde” is a green, unripened, tomato. Thanks for your comment! 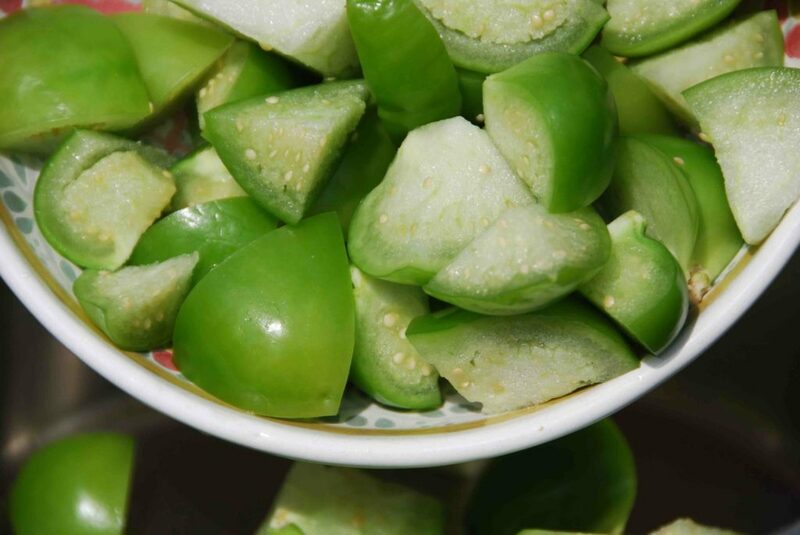 In Mexico tomatillo goes by tomate verde, it is here in the states that it is called tomatillo. So I guess you are right and can go both ways! I make this jam almost every year. Love it. And to get people to try it I say it is like a lime marmelade. It really is! I could put more lime rind in it to make it even more that way. The flavor is great and makes us happy in the winter! That is fantastic! Thank you for sharing Susan. Hola Pati, me encanta esta mermelada, muchisimas gracias por compartirla. Este año fue mi regalo de navidad para mi familia. Le encantó a todo mundo. Te quería pedir la receta para los tamales canarios. He buscado en el internet, pero los que me acuerdo en mexico son suavecitos, medio mojaditos, deliciosos y los que he hecho siempre me salen secos con las diferentes recetas que eh probado y nomas no saben igual… Por favor, necesito ayuda! Qué bueno que te gusta la mermelada! Con mucho gusto voy a subir una receta de tamales canarios pronto, a mí también me encantan. I live in Switzerland and I am probably the only person here growing tomatillos. Nobody here knows them. I didn’t either until a friend of mine from the US urged me to grow them and brought me seeds. I have a purple variety which looks really nice. I never expected them to grow so well in our climate but every year the plants produce a stunning amount of fruits! Last year with another bumper crop coming up I was desperately looking for new ways to cook them and that’s how I found your jam recipe. I tried it and I think it’s very good. Everybody I gave a jar of jam to told me they liked “that exotic jam”. 🙂 So, I will definitely make it again this year! Thanks so much for this website and your recipes! Hola Eliane, Bringing the tomatillo to Switzerland! I love it! Thank you for sharing the jam with your friends. I´m writing from Mexico City, I´m Mexican. Really, when I saw your tomatillo & lime jam I thought this woman is crazy!!! I use tomatillo to spice tacos, enchiladas, chicharron quesadillas. So it couldn´t be a jam!!! But I was really curious and I am adventuress in the kitchen so I made a batch. To tell the truth it was mega delicious. I add a cardamom pod and a piece of ginger… out of this world. Hola Jenny, I’m so happy you decided it try it!! I am definitely going to make this. It sounds delicious. But I am going to add some seranos. I love peach jam with jalapenos, but I always think it could stand just a tad more heat. So I’m going to add seranos to this one. I’m sure it’s going to be great. Thanks for sharing the idea. I cannot wait to make this!! I am so excited. I stopped buying jellies & james years ago & have just gone without – NOW I know what to make. You are the best, Pati. Just love you & what you teach!! Thank you so much!! Your recipes look so good! I want to try this jam and also give some to a friend of mine who likes to cook and eat Mexican food, but I don’t know how long it will keep – don’t want to do a water bath if I don’t have to. How long will it keep if refrigerated? Thanks for all your recipes. At least for a couple of months: great gift idea! Such an excellent use for all of those extra garden tomatillos! Do you by chance know if the small ones (that haven’t yet filled their husks, so they aren’t really ripe) are ok to cook with? I picked a ton before the frost, but I can’t really find info on it…. Thanks! I planted tomatillos some years ago and haven’t had to replant since. They come up like grass each year. I always have more than I know what to do with. I came across this recipe and decided to try it since the cupboard is full of salsa verde already. The first batch was wonderful! For the second, I tripled the recipe and added a chopped green habanero – even better. It worked fine for canning, you just have to cook it long enough to get the right consistency. Hola Dave, Thank you for trying my recipe! I’m glad to hear it works for canning!! what can i use in place of sugar? Maple syrup, honey or agave…. define to taste, add more or less as need be on your next round. HI there! I would love to make this jam since I have tons of tomatilloes in my garden! Can I can it using a waterbath? Has anyone tried this? I discovered this recipe last year when looking for something (other than salsa) to do with the dozens of tomatillos from my garden. It is amazing – I planted extra tomatillos again this year just so I could make more of this jam to share! It freezes great so we can enjoy it year-round. This year I added a couple hot peppers which added some extra zip. I make a double batch in a 2-quart saucepan, which is full to the brim when I begin. I find I have to let it simmer for almost an hour before it gets to the loose jam consistency, but my guess is it would be quicker with a larger pan and more surface area for the jam to cook down. Hola Laura, I’m so happy you are making and sharing my tomatillo and lime jam! Yes, a wider pan with more surface area should make it a little quicker. 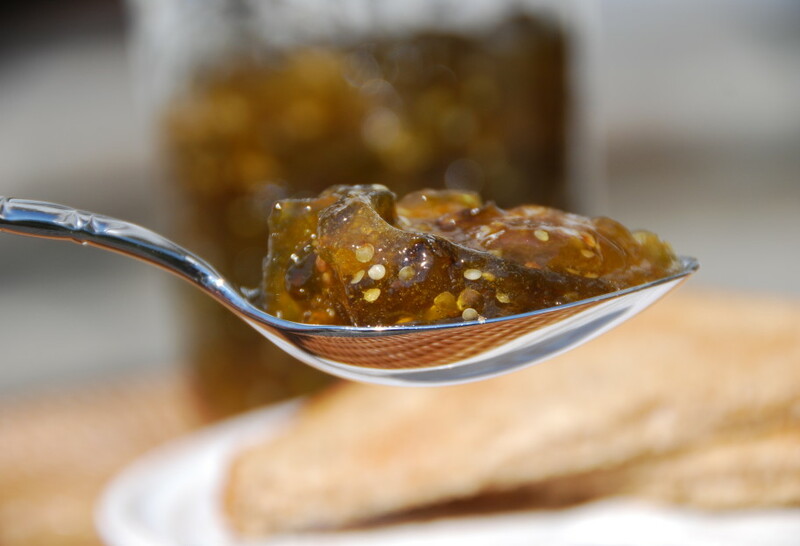 I made the tomatillo lime jam two days ago…..wow…never did I expect the flavor explosion that his jam provides. There is nothing else quite like it, the intense lime and sweetness, where has this stuff been all my life?! It is fantastic put on a cream cheese spread cracker. I will be making more of this for certain! Thank you for trying it, Norman!! Happy to hear you like it so much! Can this recipe be doubled or tripled and canned? AND YOUR STEP BY STEPS WERE GREAT. SINCE THEN I MAKE IT EVERY TWO MONTHS. I have made many of your recipes and loved all of them! reminds me of the time I have spent in Mexico…this jam I took to a bible study and am emailing the link to several ladies! what a great recipe!! Hi Carol, Thank you so much for sharing the jam with your friends!! I just finished making the jam. I simmered for about 20 minutes and it never got past the syrup stage. It is now cool and still at same stage. What went wrong? Can I cut down some on the sugar? Even as syrup, it is still delicious. I am passing your site to my kids that also love mexican food. Can you process this in a water bath and can it? Hi Pati! After seeing you make this on your program yesterday, I am just setting this jam to simmer. Smells heavenly. 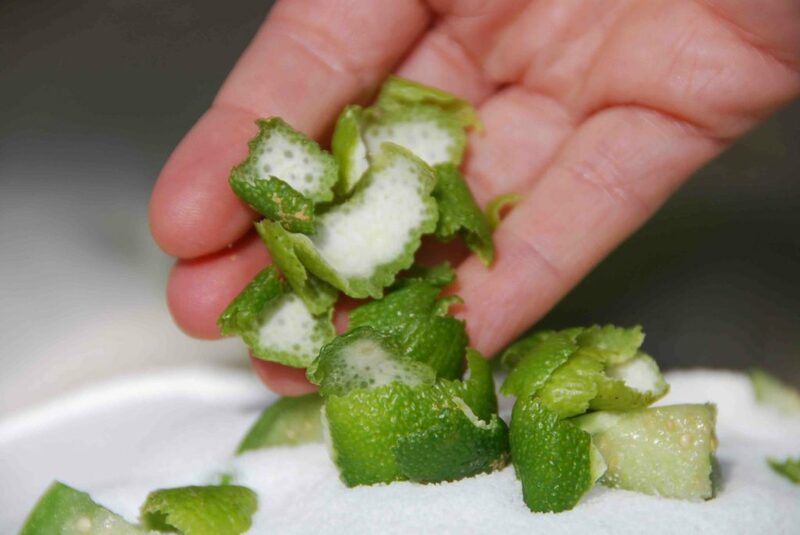 Anything with lime in it always does. Can’t wait to taste this. You mentioned you tried this with figs. It was not a success? I love figs too. Anyway, thanks for all your creative recipes and especially for your exuberant personality and enthusiasm for teaching! Ilove chile in everthing goin to make this been wantin a recipe for jam I was at Farmers market they had something like this but expensive goin to make it thank you. Made a double batch yesterday and spiced it up with two serrano peppers per pound of tomatillos and used key limes instead of regular limes. What a great jam…soooo good with cream cheese on anything!! Will certainly be making this again but will experiment with various changes in the peppers used to create differing heat levels…next up, habanero pepper! Dear Pati, I have made your jam 4 times in the last few months – even mailed it to several relatives in other states. I double the recipe each time. I add 1-2 chiles serranos for each pound of tomatillos. My husband is Mexican and all his life ate only strawberry jam – now he only eats your tomatillo jam. 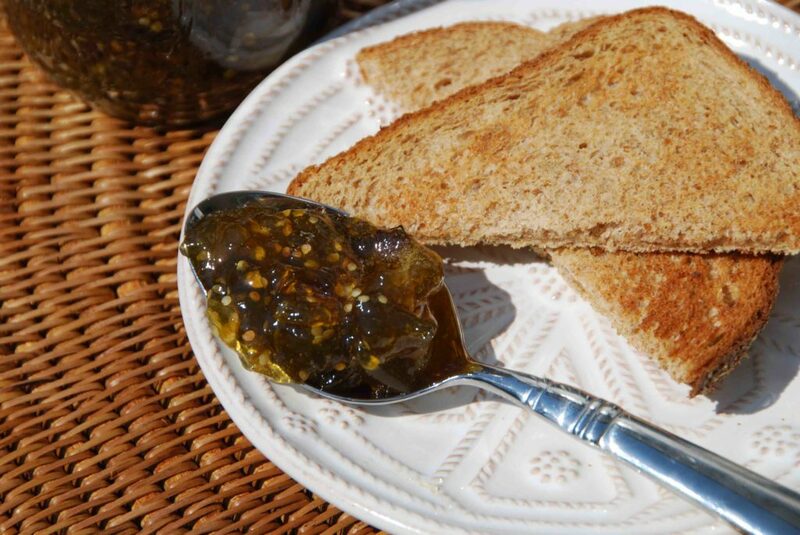 I am so excited to hear that you and your husband love the tomatillo and lime jam Maxine! Have you ever canned your tomatillo jam? If so, is there any additions I should make to the recipe for canning? Thank you. Hi Pati….just made your Tomatillo and Lime Jam. Delicioso! Do you have other suggestions of how to use it besides with cream cheese & on toast/poundcake? Pati, this is great! As I live in New Mexico, I must have chile in everything, so I cooked thin slices of a jalapeño along with it. YUM! Your program is fantastic. I made some of this tomatillo jam yesterday and really love it, especially with cream cheese. I’m wondering if you have tried making it with honey rather than sugar. I know that honey is sweeter than sugar and also acidic. 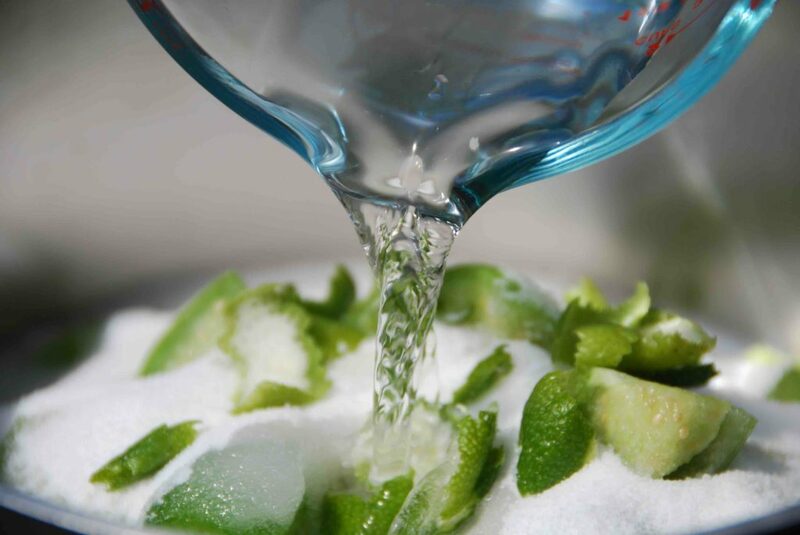 Would you suggest reducing the amount of lime juice when using honey? I’ve also seen recommendations of adding baking soda. Which would you suggest? Thanks, I enjoy your show. Hi Richard, I’m so happy to hear that you really enjoyed the jam. It is quite a delicious treat. Typically jams and marmalade are always made with sugar, but that shouldn’t stop you from being creative. Please let me know if you make the jam with honey. I’d love to hear if you like it. Also, if you use honey, I would keep the amount of lime juice the same. The lime juice enhances the tartness of the jam. Happy cooking! My daughter and I enjoy watching your show. Very easy to do receipes and authentic. I just watched the show on cinnamon. I was impressed on the receipe for horchata. My daughter said we could make mom. I will also try to make the cookies in the fall. Will you ever come and visit Chicago,Illinois for a cooking demonstration. We have a beautiful Mexican Fine Arts Museum and a large mexican population here. Congratulations on your show Pati’s Mexican Table. Hi Marilu, I’m glad you are enjoying the show! And I would love to do a cooking demonstration in Chicago! I’ll let you know if I can make it happen! I am making this again and my house smells like heaven. Thank you! The jam looks so good! I can’t wait to try it!